Discussion in 'Disney Restaurants' started by lurkyloo, Oct 31, 2016.
lurkyloo The Attic was just perfect! The other 2 times we were also at Kona & the gratuity didn’t show up on the bill then either. However, because we were told on the phone when we ordered that we should expect to tip for the cake, too, we planned for that & did. Now your response is making me wonder what the etiquette actually is...Maybe @lurkyloo can comment? But now I’m thinking, how would the tip money get to the “runner” vs. the waiter? Our cake was $37 (including tax). I’m not sure I can justify giving the waiter an additional $5 just for plunking a cake on the table. We cut and served it ourselves. Thank you so much for your thoughts on this @lurkyloo! 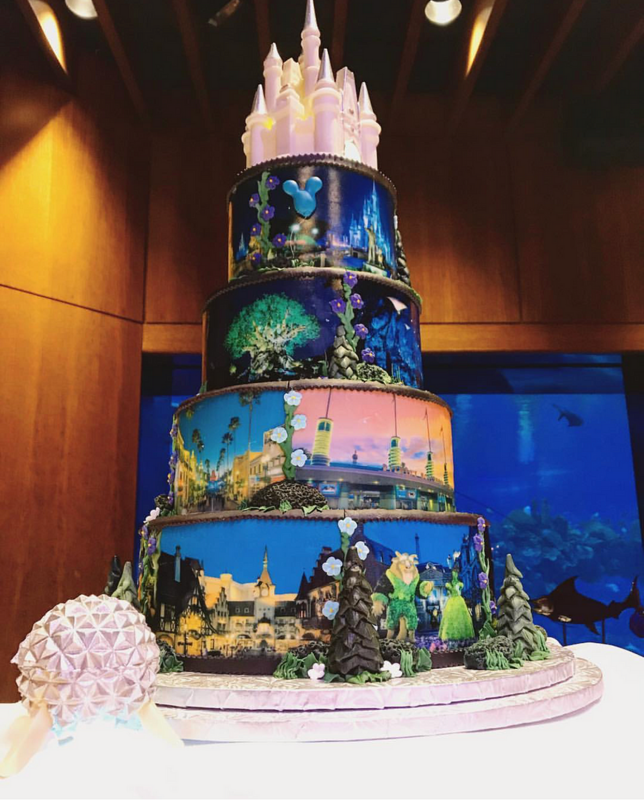 (I consider you the Disney cake expert!) What @KrazeeK120 said makes sense to me, too. We paid the suggested amount in the past because we were told to and weren’t sure exactly to whom the cake tip would go. (It makes me a bit saddened that the pastry team—or even the runner—doesn’t get it.) However, not having to pay an 18% tip on a $165 cake sounds good to me. Just got two amazing mini cakes delivered to our room at the Beach Club Resort. The first was a graduation cake to celebrate my daughters college graduation coming up in December. It was almond cake with almond crunch filling. The second was an awesome engagement cake to celebrate my daughter and her now fiancé that got engaged this week in front of Cinderella’s castle. The engagement cake was chocolate with chocolate buttercream filling. I will keep trying to post pictures. I get an error that the fie is two large. Here is the engagement cake. kmg148, MemphisVanessa, TiggerTrigger and 14 others like this. And here is the graduation cake. kmg148, MemphisVanessa, TiggerTrigger and 13 others like this. mic.keyfan It was all started by a mouse! We are visiting December 8-17 and will be celebrating our youngest son's High School graduation early while there. I'd like to order a cake for one of our dinners while there but am not crazy about the Disney Floral and Gifts cakes. Where are people getting the cute decorated cakes that I see picture of? lurkyloo, kimmy85 and marchingstar like this. I guess it helps to read it closer LOL...Thanks for the info! Hey we all have those days! yeah, I know if even possible will likely look odd, but seeing him happy is most important. I don’t want a huge multi-tier cake. An 8 or 10 inch cake will allow for plenty of sharing. TiggerTrigger, BigMommaMouse, LBlovesM&WDW and 6 others like this. Well this engagement cake is just the sweetest little thing I've ever seen!! About to call to verify my anniversary cake for next weekend! So excited! After a delicious dinneratthe Yachtsman I surprised hubby with a cake. MemphisVanessa, Brttnys, TiggerTrigger and 18 others like this. Those pumpkin Mickeys are adorable! So cute !!! What was the price on this, if you don’t mind? Hello everyone! I've been lurking and getting some ideas for my DD's 3rd birthday cake. She wants a Rapunzel cake and liked a picture of a round cake with Rapunzel on top with her braid coming down. We are staying at Contemporary and have dinner at Chef Mickey's on her birthday December 19th. I called the number given here and promptly received a return phone call from George. It seemed to go well. I explained I wanted a 6 inch cake with frosting, with 2D Rapunzel on top and braid coming down, flowers in braid and my budget was $75-100. He said he thought he knew what I meant and that it would probably be more in the range of $106-$118. I said that was fine even though I thought it was kind of high for what I was asking. I also told him I had some pictures I could send him. He gave me his email and said we could communicate that way after this initial phone call. He also said I could let him know in the email if I wanted vanilla, chocolate or marble cake, and choice of fillings were buttercream, chocolate mousse, white choc mousse, raspberry mousse or strawberry mousse. Here's where I start to lose a little hope. I emailed George with subject <last name, December 19th> I told him it was a pleasure speaking with him, and I was attaching two pictures, explained what I wanted from each, told him I chose vanilla and strawberry mousse, asked for his feedback and thanked him. This is the response I got: " When is this for? What is your budget?" Oh boy, maybe he was just busy, so I gave a rundown again of our conversation and...no response. I'm hoping this isn't an indication of how the cake is going to go! Anyway, I'm interested to see what he comes back with after seeing the pics I sent. I'd also like to ask for "pixie dust" on the cake. DD also wants a little Pascal on it but I'm not sure if they would do that? I love looking at everyone's cakes...thanks for sharing! i hope it turns out how you want my only suggestion: since you’re saying the cake is already pushing your budget, it might be worth considering picking up your own little pascal figurine (online, party store, maybe even a dollar store if you’re lucky?). you can slip it to the server and ask if they’ll add it to the side of the cake for you? looking forward to seeing how your cake turns out! lurkyloo and vanjust14 like this.